This has consequences for our own lives because we’re made in the image of God. In the Greek translation of the Old Testament, the same word, eikon, is used in Genesis when describing the creation. “Let us make man in our image, after our likeness” says God (Gen 1:26). The implication is clear. To be made in the image of God is more than a pious slogan. It’s a statement of fact. Every one of us shares — in a limited but real way — in the nature of God himself. When we follow Jesus Christ, we grow in conformity to that image. Thinking about the relationship of Caesar and God, religious faith and secular authority, is important. It helps us sort through our different duties as Christians and citizens. But on a deeper level, Caesar is a creature of this world, and Christ’s message is uncompromising: We should give Caesar nothing of ourselves. Obviously we’re in the world. That means we have obligations of charity and justice to the people with whom we share it. Patriotism is a virtue. Love of country is an honorable thing. As Chesterton once said, if we build a wall between ourselves and the world, it makes little difference whether we describe ourselves as locked in or locked out. True freedom knows no attachments other than Jesus Christ. It has no love of riches or the appetites they try to satisfy. True freedom can walk away from anything — wealth, honor, fame, pleasure. Even power. It fears neither the state, nor death itself. Here’s the second reason. The purpose of religious liberty is to create the context for true freedom. Religious liberty is a foundational right. It’s necessary for a good society. But it can never be sufficient for human happiness. It’s not an end in itself. In the end, we defend religious liberty in order to live the deeper freedom that is discipleship in Jesus Christ. What good is religious freedom, consecrated in the law, if we don’t then use that freedom to seek God with our whole mind and soul and strength? Here’s what that means for each of us: We live in a time that calls for sentinels and public witness. Every Christian in every era faces the same task. But you and I are responsible for this moment. Today. Now. We need to “speak out,” not only for religious liberty and the ideals of the nation we love, but for the sacredness of life and the dignity of the human person – in other words, for the truth of what it means to be made in the image and likeness of God. 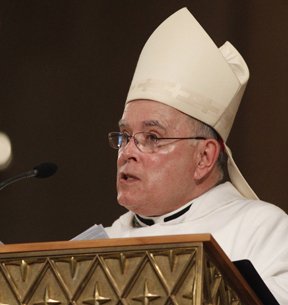 Hopefully Archbishop Chaput will understand that being a “witness for the truth” includes his removal of the many who work at Archidiceses headquarters, “222”, — Monsignor Lynn was not the only member of clergy and laity at “222” who knew about the policy of Cardinals Krol, Bevalaquia and Rigalli and their staffs of covering up the crime of sexual abuse by clergy and other employees of the Archdioceses. Being a “witness to the truth” includes clenaing house of evil and acknowledging the cover up. “Fire”a couple Excellencies” over their criminal pedophilia cover up and I will begin to hear what you are saying.. Words, words, words…sorry but Bishops are a pack of hypocrites! The victims, their families, supporters, advocates, etc. have certainly applied this principle of “public witness to the truth” as the facts, evidence, statements, reports, internal documents, etc. have been revealed concerning the management of sexual abuse allegations by the leaders of the Archdiocese of Philadelphia. What an inspiring homily, Archbishop. Thank you for being the shepherd we have longed for!! !